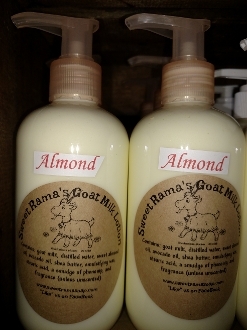 Our 8oz lotion made from : fresh goats milk, distilled water, sweet almond oil, avocado oil, emulsifying wax, stearic acid, shea butter, a smidge of phenonip or optiphen (to keep the milk from turning), and added fragrance. (unless unscented) This product will keep you hands (and the rest of your body) soft and smooth all day long! Choose unscented or one of our great fragrances!